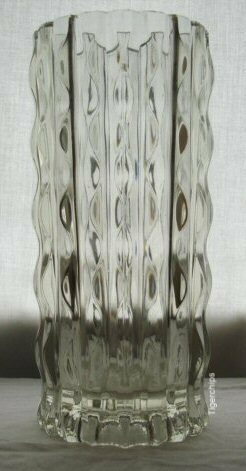 Valuing in a charity shop today, there was a typical clear glass Sklo union large cylinder vase with the usual moulding. However in tiny embossed letters onder the base it read FIDENZA ITALY. The only difference I could see was that the foot-rim was not ground as are the Sklo vases. maybe I should have grabbed it for reference. They are both vintage i believe and i don't think anyone knows who copied who.